Dogs vigorously keep pace with deer as the top pest problem in flower gardens. At least deer damage stops at soil level; you don't witness deer digging moon craters in the garden. In addition to digging and gnawing on plants, dogs add insult to injury by urinating and defecating on flowers and around plants. This can result in emotions ranging from the mild consternation of replacing a few tattered petunias, to the meltdown that comes from the discovery of a very slow-growing climbing hydrangea chewed down to the nub. Yes, we love our dogs, but must it come at the expense of a lovely blooming landscape? 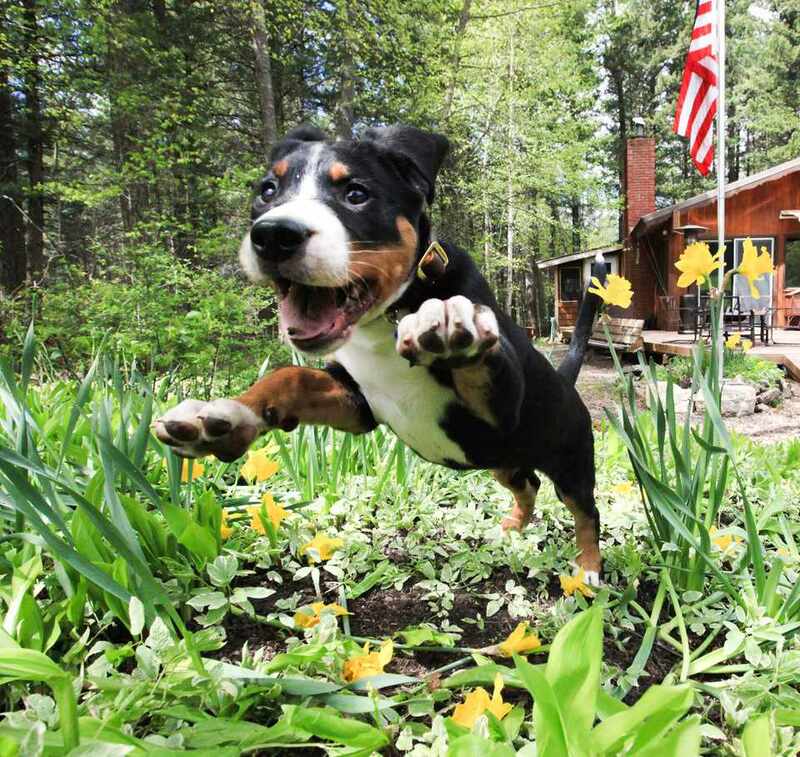 To properly address the issue of keeping dogs out of flower gardens, you must first understand why dogs are drawn to gardens. This is about more than just twitchy paws, or a bored dog. Flower gardens draw dogs like a magnet from other untended parts of the landscape for several reasons. First, there are the sights and smells of you, beloved owner, working in the soil. If you hang out there so much, leaving the comforting scent of you behind, then this must be a great place to flop down and work on that chew toy. Second, there is the matter of that wonderful loose soil you've worked so hard to amend. Not only is it supremely easy to dig, it's also filled with flavorful manure and partially decomposed compost. Yummy! Creating a cool hidey-hole to lie in, and unearthing interesting critters like moles and earthworms are also fun activities that go along with digging. Finally, flowering plants themselves are interesting to dogs. With their superior senses, the different smells and textures of plants are like an ever-changing salad bar, beckoning dogs to sample and chew. Many gardeners turn to dog repellents as a first line of defense, as it's convenient and inexpensive to grab a box or bottle of something off the shelf at the garden center. Many of these products rely on strong aromatics that are irritating but not harmful to pets, like citrus or peppermint oils. Effectiveness can vary greatly depending on your dog's sensitivity. A downside is the need to reapply frequently, especially in times of wet weather. Look for products embedded in gel crystals, which slowly release the offending scent and can endure periods of rain. A quick homemade spray can help a garden in transition, such as the beginning of the growing season when tender new growth and germinating seeds are most vulnerable to damage. A daily spritzing with low-acidity vinegar or bitter apple product repels dogs, but harms neither plants nor animals. Or, you can up your vinegar game by using horticultural-grade vinegar (20% acetic acid) to kill weeds and discourage dogs at the same time. Take care to shield ornamental plants from overspray, as this vinegar is designed to kill plants indiscriminately. An ultrasonic dog repelling system may be an option if you have a problem with neighborhood dogs invading your flowerbeds. The ultrasonic sounds combined with LED lights on some models are designed to startle dogs into avoiding a large area. A con to this method is that it will frighten away all animals, including the squirrels and birds you might enjoy watching in your garden. Ultrasonic deterrents also tend to break after a couple of seasons. If good fences make good neighbors, they also make good dogs. However, it isn't always practical or affordable to erect an effective fence around flowerbeds, especially for larger dogs. An electric fence, whether above or below ground, is sometimes a more convincing exclusion device for stubborn dogs. These fences are very humane, and deliver a static shock that won't harm him, but will feel unpleasant enough to teach him that the flowerbed is not his fun zone. An underground fence system coupled with a receiver collar gives gardeners a correcting alternative that isn't an eyesore or danger to children. Flags that you place around the garden border teach dogs where the no-go zone is, and a static correction reinforces the message to stay out of the flowerbeds. While this requires the most dedication, training your dog to avoid a certain part of the landscape, combined with supervision and enrichment with appropriate toys and games, yields some of the most satisfactory results. Add training with positive reinforcement methods to other deterrents, and you will increase your chances of success. What Are Some Harmful Garden Pests You Shouldn't Ignore?